Chris Norris began writing articles for fitness magazines in the late 1980’s and published his first book (Weight training, A&C Black) in 1993. Since then he has written literally hundreds of articles for fitness, health, and therapy magazines and published nine books. Many of his books have gone into second and third editions and have been published in several languages. His latest book, the 5th edition of the re-titled Sports and Soft Tissue Injuries is due for release in August 2018. Download Chris Norris’ full book list (PDF). The fifth edition of the retitled Sports and Soft Tissue Injuries sharpens its focus on the treatment of sports injuries, providing the most complete evidence-based guide for physiotherapists, sports therapists and medical practitioners working with athletes. Opening with chapters that examine the underlying science of tissue healing and principles of rehabilitation, the book employs a systematic approach, with chapters covering each area of the body, from facial through to ankle and foot injuries. Every chapter includes in-depth discussion and guidance on the treatment of common sports injuries, drawing on the author’s wealth of personal experience and the latest peer-reviewed research. 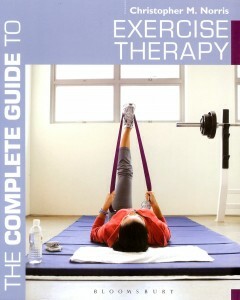 A complete educational resource, Sports and Soft Tissue Injuries is highly illustrated in full colour, and features a companion website with video examples of therapy techniques. This new book is an important text for students of sports therapy, physiotherapy, sport medicine and athletic training, interesting further reading for sport and exercise science students with an interest in sports injury, and a crucial reference for practicing physical therapists and related disciplines. · Yoga and clinical Pilates for back rehabilitation. The Complete Guide to Back Rehabilitation is the essential resource for all experts involved in back care, including massage therapists, exercise therapists, physiotherapists and fitness professionals. This Complete Guide clearly outlines both the theory and practical tools to produce an effective back rehabilitation programme and offers advice on how to protect clients against further damage. For its 3rd edition (2007) the complete guide to stretching has been expanded and fully updated. Full colour photographs and live models are now used for each exercise and 157 exercises are featured. The book has 248 pages divided into three main sections: scientific principles, exercise description and practical application. Each section is colour coded for easy identification. There are 17 chapters with 80 colour line figures and 17 detailed tables. In section (i) biomechanics, joint structure and function, muscle action, posture and stretching research are fully covered. Section (ii) details beginner, intermediate and advanced stretches. Partner and dynamic stretching is covered with new material describing stretching to nerves and fascia- a vital part of rehabilitation. Part (ii) details stretching and trigger points, measuring flexibility, stretching and sports injuries and sport-specific stretching. Exercise therapy is an essential part of many treatment programmes. This new book provides clear and accessable knowledge for therapists, trainers, coaches, and fitness professionals. Looking at body tissues & healing, assessment of injuries, structuring a rehab programme, working with clients, and exercises region-by-region this book is comprehensive and accessable. A practical guide to a burgeoning specialist area for fitness professionals and physiotherapists. A comprehensive guide to clinical massage techniques, tackled in Chris Norris's clear and accessible style. Packed with photographs and clear descriptions. The e-book version also contains video clips showing the massage techniques in action. From the tools of the trade to how to use techniques most effectively on patients this is a must have guide for all trainee and practising masseuses, physiotherapists, sports therapists and fitness professionals. This new addition to the well-known Complete Guide series covers the background into the structure and function of an area, the key signs for recognising symptoms and how to treat injuries with massage, taping and hot/cold techniques. Fully illustrated and packed with photography ranging from exercises to massages to suit specific injuries, it outlines the correct position and technique. The physiology is clearly illustrated and taping methods are clearly explained step-by-step. Now in its fourth edition with the revised title - Managing Sports Injuries: a guide for students and clinicians - this highly practical guide maintains its evidence-based approach while introducing new material from both research and clinical sources. It is a comprehensive resource for the management of soft-tissue injuries, focusing on therapy. Well referenced and extensively illustrated, this text continues to be invaluable to physiotherapists, sports and massage therapists, medical practitioners, and all those involved in the treatment of athletes and sports people. This edition is now out of print (available in e-book format only) and replaced by Sports & Soft Tissue Injuries 5th edition (above). The 2nd edition of the popular Acupuncture Pocketbook has a fresh colourful design. Two colour line drawings are used throughout with over 380 separate points detailed. Colour tabs are used to differentiate each meridian, simplifying the point search process. New figures enhance clarity with important surface anatomy relations clearly shown. Point usage and needling technique is described, and points are grouped regionally for ease of selection. Both Western Medical Acupuncture (WMA) and Traditional Chinese Medicine (TCM) indications are used. Tables list point categories and conditions are indexed. Based on Chris Norris popular 3 day course this book describes a muscle balance approach to rehabilitation of the spine. Biomechanics/stabilisation mechanisms/posture/muscle imbalance/abdominal training/establishing stability/advanced training/building a program/preventing re-injury. 2000, 272 pages, 251 figs, Hardback. Human Kinetics. Based on the hugely successful Complete Guide to Stretching,this new series from Chris Norris is a sport-specific three-phase programme of stretching, from beginner level, through intermediate stretches, to advanced dynamic development. Chris introduces the book with some advice on self-assessment and warm-ups, and at the end of the book there is a training log to assess development and a handy section on treating injuries encountered in running. With stretches illustrated with full-colour photography, and in a handy training bag-sized format, Stretching for Running is your ideal running partner. Based on the hugely successful Complete Guide to Stretching,this new series from Chris Norris is a sport-specific three-phase programme of stretching, from beginner level, through intermediate stretches, to advanced dynamic development. Chris introduces the book with some advice on self-assessment and warm-ups, and at the end of the book there is a training log to assess development and a handy section on treating injuries encountered in racquet sports. With stretches illustrated with full-colour photography, and in a handy sports bag-sized format, Stretching for Racquet Sports is your ideal partner on court. The essential reference for all those using gym-based exercises. Bodytoning explains the principles of training preparation, body fuel systems, how muscles work and factors affecting body shape. The reader is then taken through a series of exercises adaptable for all levels of ability working with weight training machines, barbells, dumbells, bands, gymballs and stretches. With an emphasis on safety throughout, Bodytoning offers clear and comprehensive illustrations, full colour pictures, up to date background information and cutting edge training programmes. In addition to basic programmes, you will find information on core stability, power, speed, stretching and specific programmes for target populations including back pain, pregnancy, circulatory problems and general aches and pains. With its science based, cutting edge approach Bodytoning is a must for today’s gym user. Links practical physiotherapy techniques with acupuncture.